The recent Muslim Terrorist attack in London is just another nail in Western civilization's coffin if we are continued to be led by Political Hacks who totally misjudged what we call multiculturalism in Europe. Tony Blair of Britain and others like the dumkoffs in Canada were planning a paradise on earth. The only problem being, you cannot work with people whose goal is to kill you when they have gotten strong enough. In AD 627 Mohammed signed a 10 year peace pact with the Qurayza Jewish Tribe and after two years slaughtered the men and raped the women into subjection. He beheaded the men and the pubescent boys and enslaved the women and children. In doing this, he wiped an entire tribe "off the map" to use the language of the President of Iran, recently. Dar al-Islam is the “House of Submission”—the territory of submission to Allah—and Dar al-Harb is the “House of War”—any territory not subservient to Islamic Law (the Sharia). All countries not in conformance with the Sharia are Dar al-Harb, and all orthodox Muslim migrants that enter those countries are holy warriors whose job is to struggle against the host culture, not to assimilate. 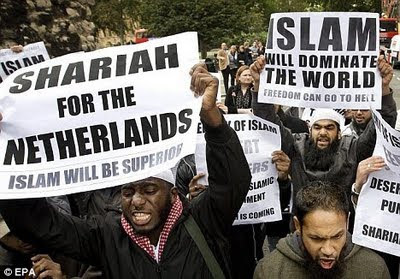 The ultimate goal is to force the Islamization of the host culture by means of a Grand Jihad within the context of a globalist Civilization Jihad. Every orthodox Muslim participates in this Jihad to the greatest extent possible. And migrating to a new country to spread Islam is Hijra. and have lost the fire of God in our churches and individual lives. MOODY NEWS wrote: "90,000 Christians were murdered for their faith around the world in 2016 according to the Center for the Study of Global Christianity, the number of Christians martyred in the last decade at 900,000 which amounts to one Christian killed every 6 minutes. Amy Kellogg explained that their definition for a martyr is anyone who lost their life prematurely as a result of human hostility, while they were upholding Christianity. In August, 2001 by the grace of God, 8 Muslim refugees were won to Christ in Norway. Since that time more than 1,000 Muslim refugees have been baptized in that small Church. We can do that by God's grace in Canada. That is the WAY to peace in the world. Convert the barbaric Killers to Jesus Christ Who shed His pure and perfect blood to save us all. WHY is this so? Jesus Christ is the Way, the Truth and the Life. (John 14:6). Amen.